This refreshing fall apple cider pedicure stimulates circulation, revives tired feet, and exfoliates the lower legs and feet. A whirlpool soak warms the feet prior to an invigorating scrub and relaxing, in-depth foot and lower leg massage. Clients can enjoy this service in the spa or on the Cedarbrook Lodge’s Waterfall Terrace. 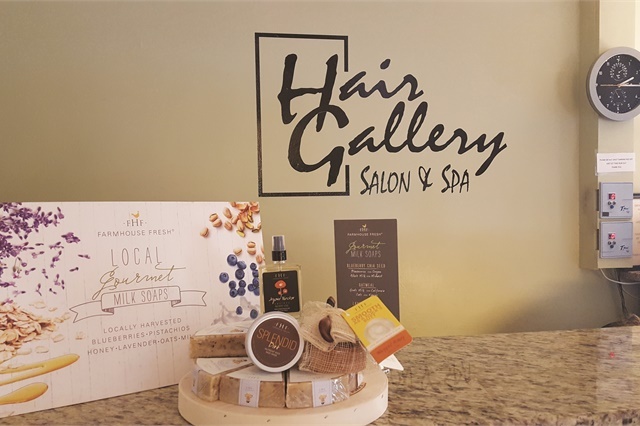 “The Pumpkin Spice Experience is probably one of our best sellers because it smells amazing,” says salon owner Doina Stanciu. 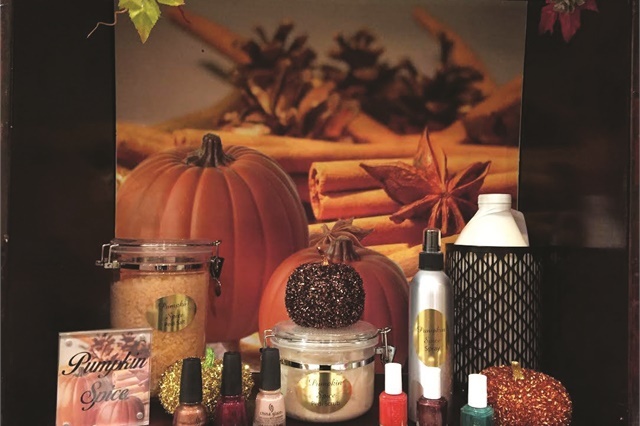 “It’s a delectable treat for your feet.” The treatment includes a splash around in a pumpkin spice foot bath, followed by a pumpkin spice scrub, warm pumpkin moisturizing mask, and hot stone foot massage. The experience is finished with clients’ favorite fall polish. State of Mind Salon and Day Spa, Crown Point, Ind. “Cinnamon apple is our guests’ favorite signature scent in the fall,” says salon owner Pattie Kobe. Clients enjoy a cinnamon spiced tea while soaking in a cinnamon foot bath. Next, skin is smoothed from knee to toe with an apple and vanilla sugar scrub and wrapped with hot towels guaranteed to melt away the dry skin. The final touch is an apple cinnamon leg and foot massage that leaves clients feeling warm and cozy. The Christmas Cake Pedicure treatment starts with a glass of sparkling wine and a slice of Christmas cake while clients’ feet soak in a warm footbath fragrant with ginger, nutmeg, and cardamom. 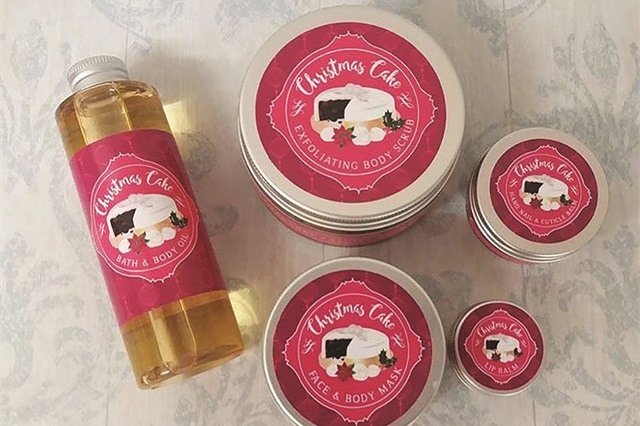 The soak is followed by a foot scrub, massage, and mask — all scented with a festive combination of apple, pear, cinnamon, and cumin seed, which melt into a soft and creamy vanilla cake scent. Toenails and cuticles are tidied and finished off with a professional polish using Vinylux by CND. The Hair Gallery Salon and Spa, Fiskdale, Mass. This spicy and sweet treatment features a fine-grain sea salt scrub deliciously scented with honey, cinnamon, and nutmeg, custom-blended with a thick, rich pumpkin mud puree to provide a thorough, even exfoliation. Clients’ skin is invigorated and detoxified, and a final gentle massage with an oil rich in sandalwood and amurense bark extracts gives skin a non-greasy but glistening appearance that takes away the appearance of dryness and wrinkles. Asha SalonSpa’s Express Aroma Manicure/Pedicure luxuriously pampers fingers and toes with fall scents: wintergreen, violet, and ylang ylang. The treatment is centered on clients’ nail needs and includes nail filing, cuticle care, a moisture massage, and polish. 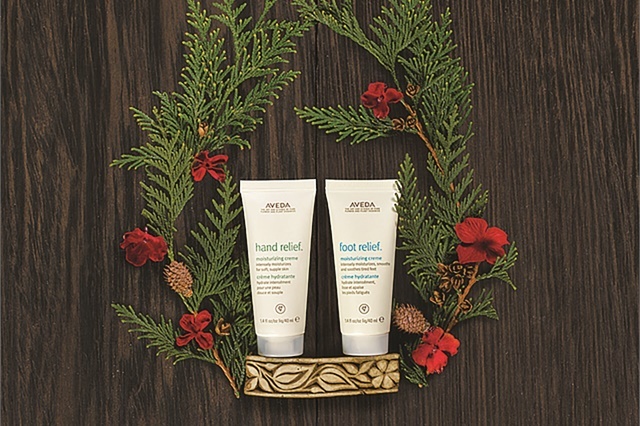 Clients also receive a complimentary Aveda Pure-Fume. The custom-made scent is enhanced with Aveda’s Fire Nature Key Element to balance your mind, body, and spirit. Zama Massage Therapeutic Spa, Portland, Ore. This luxurious pedicure begins with Butter Brulee Powder Milk Bath from FarmHouse Fresh. Feet and legs are exfoliated with an aromatic Triple Shot Caramel Coffee Sugar Scrub. Next, clients sit back and relax with a hot towel wrap for the feet. Fair trade warm cocoa butter is drizzled over the lower legs and feet, followed by a relaxing hot stone massage. The client’s feet and legs will be deeply nourished, skin will feel hydrated, and your client’s mind will rest. After expert nail and cuticle care for the feet, the pedicure finishes with a gentle buff to shine or polish.